During the month of January 2019, Wesbury residents, staff and volunteers gave 110.5 hours of service through various public engagement-community involvement opportunities. Thank you for your time and service to the community! 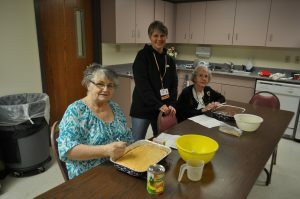 Residents baked desserts for Cochranton American Legion, became Pen Pals with Saegertown Students, clipped coupons for troops, made treats for the Humane Society, Cards for Kids, Cochranton Preschool Goodie Bags and participated in the Mealtime with Mentor program. Wesbury staff participated in Leadership Meadville, a Chili cookoff, Key Club Leadership Day and served on MMC (hospital) Board and committees, CCYSA (Soccer) Board, CATA (transportation) Board, Meadville Public Library board, Meadville Ministerial Association. Wesbury staff worked with clinical students and facilitated a blood drive on campus. Wesbury staff are Sunday School teachers, worship team members, they visit hospital patients, conduct funerals, help with community dinners and attend community celebration events.